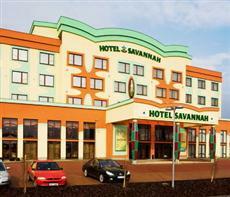 An all-round hotel with a host of business and leisure facilities, The Savannah is ideal if you are looking for 4 star Znojmo accommodation. Located outside Znojmo city centre by the border with lower Austria, The Savannah Hotel offers elegant and stylish rooms, a fab restaurant and a fully-equipped Wellness & Ayurveda centre. Planning a meeting in Znojmo? The Savannah Hotel has 8 meeting and conference rooms full of natural light and equipped with air conditioning combined with the latest technology to make your event a success. If you are organizing a large gathering or banquet, the rooms can be joined together to create the ultimate space for your special day. The hotel staff are on hand to help you out and ensure that the festivities run smoothly. The Savannah Hotel has a long-standing relationship with local culture and history experts in the city of Znojmo and many of the region's wineries and can offer a variety of activity packages so that you can make the most of your stay in Znojmo. Next door, you will find The Casino Route 59 where you can try your luck with the slot machines as well as live games in a relaxed environment. If this is all to much, then you can abandon your senses in the Wellness & Ayurveda centre. Wireless internet is available in all public areas of The Savannah Hotel.